From the Baldwin County Courthouse, go west on Hancock Street for 2 blocks or 0.2 mile (or the one large block containing Georgia College & State Univ.). Turn right on Clarke Street. Go one large block or 0.2 mile. Turn left onto Highway 22 west (Montgomery St.). Go west for 7.8 miles on Highway 22. Turn right on Lawrence Rd. Go 0.6 mile. Turn right on Fishing Creek Church Rd. Go on Fishing Creek Church Rd. for 0.9 mile (you will see a small white church at the end of the road). 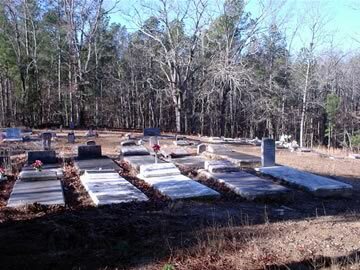 The cemetery is on the left before you get to the church. Ga. Pvt. 345 Serv. Bn. Ga. Tec. 4 Trans Corp.
Marker found in an early index but not found in 1999.